Every effort is made to report the correct information of suppliers listed on the site. The use of the information is done at your own risk and AnythingAuto.co.za may not be held responsible for incorrect information supplied, “broken” links or inactive supplier’s websites. We furthermore accept no responsibility or can not be held liable for any damages, inability to use, or the results of use of this site or any of the suppliers listed on the site. 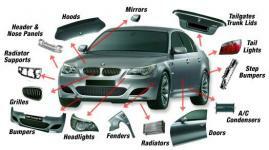 AnythingAuto.co.za provides links to supplier’s websites as a convenience to the users. If you follow these links, AnythingAuto.co.za is not responsible and cannot be held liable for damages as a result of usage of these sites and their content. The usage of these links is done entirely at your own risk. AnythingAuto.co.za may also not be held liable for any damages as a result of ineffective products or services provided or supplied by the listed advertisers. Furthermore, AnythingAuto.co.za reserves the right to make any changes to the content and layout of the site we feel is relevant for the effective usage of the site. AnythingAuto.co.za creates a platform for internet users to easily find and source various suppliers and service providers in the motor industry. The site is divided into various, easy to navigate, categories to assist the users to easily find suppliers specialising in specific products or services they are looking for.